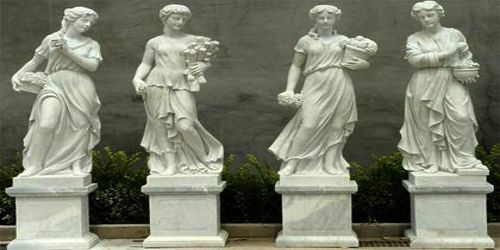 The Classical period witnessed a rapid improvement in Greek statuary. There was a dramatic rise in the technical skills of Greek sculptors in their ability to depict the human body in a relaxed rather than rigid posture. In the early 5th century Greek artists began consciously to attempt to render human and animal forms realistically. This entailed careful observation of the model as well as understanding the mechanics of anatomy – how a body adjusts to a pose which is not stiffly frontal but with the weight shifted to one side of the body, and how a body behaves in violent motion. The successors to the archaic kouroi, mainly athlete figures, are thus regularly shown ‘at ease’, one leg relaxed, with a complementary shift in the shoulders, and the whole emphasized by contrasts of rigid and relaxed in limbs. Classicism improved on the rigidity of the Archaic idiom and brought a more natural sense of movement and corporeality to the human figure, as exemplified, for instance, in the metopes and pediments of the Temple of Zeus at Olympia. Also, bronze became the predominant medium for monumental free-standing statues, not least because of the metal’s ability to hold its shape – no matter how complex – which enabled the creation of less rigid poses. As well as being stronger and lighter, a bronze figure could be stabilized by placing lead weights inside its hollow feet. 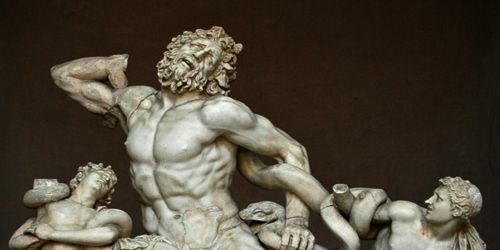 Classicist sculpture continued to be primarily connected with religion, and included the full panoply of Greek divinities and mythological figures. Thus, in addition to the twelve Olympian Gods and Goddesses – Zeus, Apollo, Poseidon, Demeter, Hera, Artemis, Hephaistos, Athene, Ares, Aphrodite, Hermes, and Hestia – sculptors carved minor divinities such as, Dionysos, and his cycle of satyrs, nymphs and centaurs; Pluto and Persephone; Eros, Psyche and Ariadne; the Muses, Graces, Seasons, and Fates; as well as heroes, including Achilles, Herakles, Theseus, Perseus, and others. 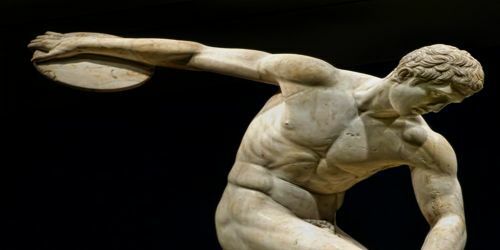 In addition to religious works, Classical artists also produced a range of three-dimensional sporting figures, depicting athletes of various kinds, including discus-throwers, runners, wrestlers and chariot-racers. Curiously, however, historical sculpture as practiced in Egypt and Assyria was almost unheard of in Ancient Greece. Important events were depicted in mythological terms, rather than through factual narrative. Another characteristic of Greek Classical sculpture is the emergence of named sculptors, although their works are known almost entirely through later Roman copies. The greatest sculptors included: Kalamis (active 470-440), Pythagoras (active c.440-420), Phidias (488-431 BCE), Kresilas (c.480-410), Myron (active 480-444), Polykleitos (active c.450-430), Callimachus (active 432-408), Skopas (active 395-350), Lysippos (c.395-305), Praxiteles (active 375-335), and Leochares (active 340-320). Leda and the Swan (500-450) by Timotheus. The Tyrannicides Hamodius Aristogeiton (c.477) by Critios. The Charioteer of Delphi (c.475) by unknown artist. The Farnese Heracles (5th Century) by unknown artist. Statue of Zeus (c.432) by Phidias. Wounded Amazon (440-430) by Polykleitos. Statue of Zeus in the Temple of Zeus, at Olympia (c.432) by Phidias. Aphrodite of Knidos (350-40) by Praxiteles. Apollo Belvedere (c.330) by Leochares. Artemis with a Hind (c.330) by Leochares. The Farnese Hercules (350-300) by Lysippos. The Victorious Youth (350-300) attributed to Lysippos.